From the hill overlooking the rugby league fields at Paparoa Park, The Firm are making their presence heard. The Firm – a tongue in cheek reference to gangs of English football hooligans – began over a Sunday barbecue as a loose supporters group for the Howick Hornets Rugby League Club. It has since become a driving force off the park. Members help out with fundraising for the junior teams at the club, and have enjoyed watching the most successful Hornets season across the grades since 2011. They have some of the best seats in the house at Paparoa Park, parking up plastic chairs high on the hill around the half way mark. Member Dave Evans says despite the sometimes salty language that comes out of their section, the atmosphere they create is positive. 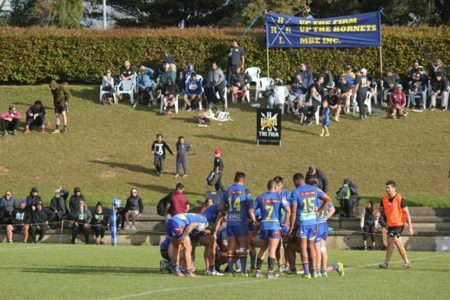 Howick has traditionally been a stronghold of rugby union, and the Hornets have at times struggled for money, supporters and players. Junior Club Captain Denie Allen says in recent years The Firm’s sponsorship has contributed to wet weather gear for junior coaches and managers across the club, warm clothing for junior players and formal attire for representative teams. “To be fair it’s also about trying to get a bit of buzz around the club. It’s trying to get people down and involved in the club.” added Evans. The growth of The Firm has coincided with a strong season on the field for Hornets teams across the grades. Under 13 and Under 15 level teams made Grand Finals, the Under 20s placed 2nd on their open weight grade ladder, and the Premiers and Reserves are secure in the top four of their respective divisions. The Premiers are guaranteed a place in the playoffs, and will be hoping to win their first SAS Fox Memorial trophy since 2011. To do so, they will need to overcome the table-topping Pt Chev Pirates, who stopped the Hornets with a ruthless 32-16 victory on Saturday.